During my life in Delhi, Holi came and was gone twice. The days preceding the event were usually filled with enthusiastic description of Bhaang, the experience from drinking that from the previous year, the preparation. My friends would order a swimsuit or two from online world, usually in royal blue hue, matching seamlessly with the sprawling swimming pool of the resort of Gurgaon. Some had their brothers coming back from hostels for a week. Some would go for a long road trip. When I would mention of Mathura or Vrindavan, the usual look was “why would you visit a place that crowded?” I was a lone lady wolf in Delhi. My holi would necessarily be staying indoors, binging on Arabic Biryani (yes, the Vasant Kunj shop) and watching Forest Gump for the umpteenth time. Life brought me to Bangalore in a few years. The soul of the tech city struggles to find one single excuse to escape to the Nilgiri hills or to the coast of Arabian Sea. Half of my college mates never heard about the legacy of Laath Mar Holi. And then, life happened again. I became a travel blogger! It suddenly dawns upon me, none talks about the Basanto Utsab that we celebrate in the East of the country! It is one thing to celebrate Holi with hedonistic Bhaang, a burst of colors, away from the town in a resort of farm house, making merry with friends or families. It is another thing to celebrate Basanta Utsab, fondly referred to as Dol, at the university town of Bolpur, Shantiniketan in West bengal. 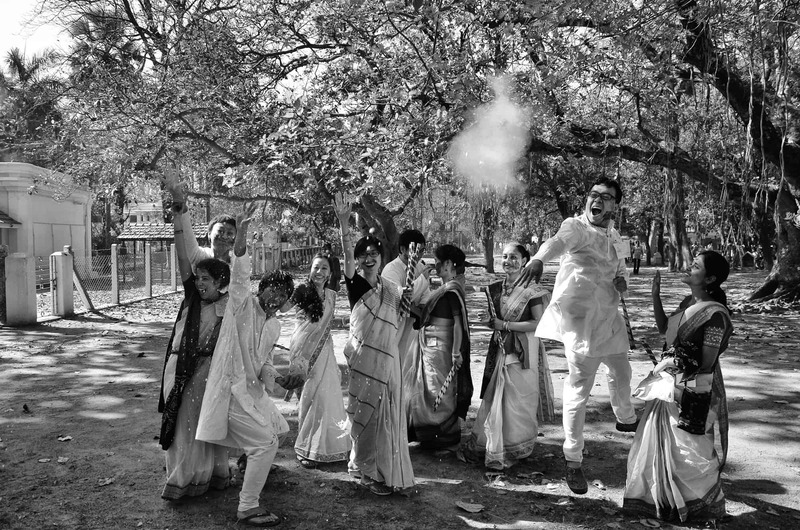 Basanta Utsab ( Spring Festival) stays true to the quintessential liberal arty character of Shantiniketan. ‘Apart from worshipping the Formless, no community may worship any idol depicting god, man, or animals; neither may anyone arrange sacrificial fires or rituals in Santiniketan…. No insult to any religion or religious deity will be allowed here. The sermons given here will be such that will be appropriate to the worship of the Creator and Father and will help in ethics, benevolence and brotherhood…’ said the founder Maharshi Devendranath Thakur, who took an instant liking of the vast land back in nineteenth century and purchased it from the Jamindar for a token money of Rs 1. An erstwhile center for spiritual practice making no discrimination for religions, Shantiniketan became an institute with Rabindranath Thakur’s efforts, imparting education deeply rooted in Indian heritage. Starting from the manuscript of Tibet to the Slokas of Tamil temples, every resource was indispensable. Many notable alumni of Ashram* contributed to the mankind. Even before Taliban took control and America started to bomb, there thrived an amusing culture in Afghanistan. Saiyad Mustafa Siraj was the first person who introduced me to the country and impeccable style of travel writing in his book Deshe Bideshe. Multiple times he had referred to his life in Shantiniketan during the journey. 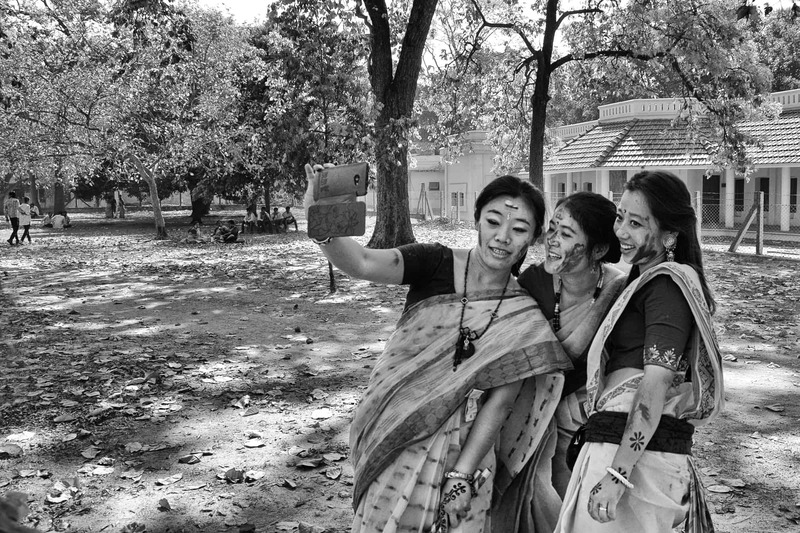 The Noble laureate, Amartya sen, refers to Shantiniketan as home. And in line with my ancestry from Bankura, let me take pride in mentioning the pioneer sculptor Ramkinkar Baij. You can not take a stroll in the campus without noticing the fine exemplary of nature inspired Santhal human mechanisms. And these are just a handful examples of many talents the university churned out. 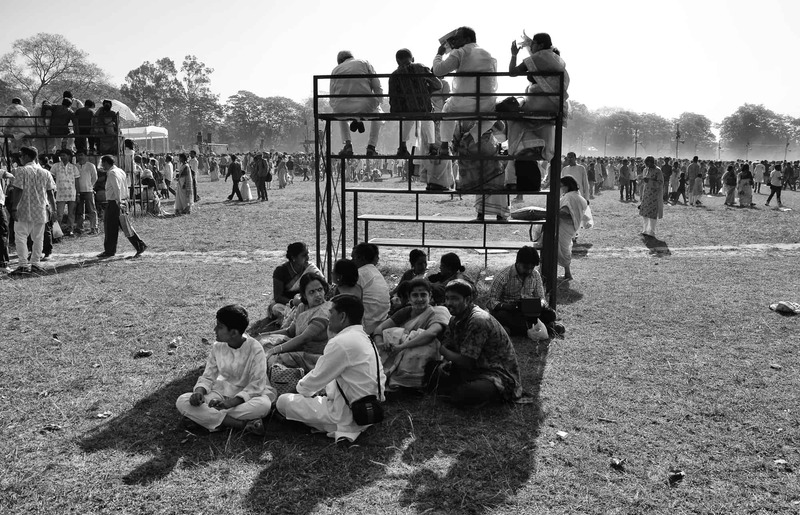 Basanta Utsav in Shantiniketan differs largely from the Holi celebrated in North India. The color is also known as Aabir, essentially organic. There is no Bhaang in the vicinity. Participation from every strata of society is encouraged and celebrated. It is not unusual to find the local tribe women dancing hand in hand forming a circle. The students of Pathabhaban (the school) and University (Bishwa Bharatai University) start dancing from the famed Chatim tree, the tree that brought enlightenment and peace on the founder. A group of people, basking under the sun. Look at the faces. Peace and joy everywhere! The celebration goes on with music, dance, spontaneous expression of people and love. I have never heard or personally felt the threat of being groped or assaulted. If crowd makes you weary, take a stroll to the Khoyai. The purple soil of the river bed had amused plenty of Bengali film makers to shoot a scene or two in the wilderness. A deer park lies by the river bank. Make a stop to watch the locals estracting palm syrup from the trees. A baul wanders away with an ektara (ukulele). the walls flaunt jatra posters, often in Olchiki (Santhal language). 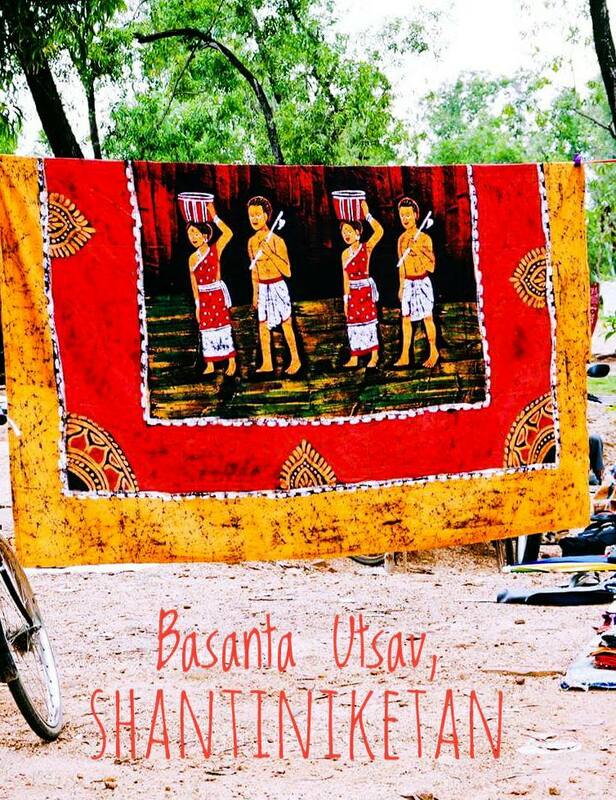 Basanto Utsav at Shantiniketan calls for countless footfall, majorly from bengali households. We highly recommend to arrange for a stay before you visit. There are plenty of hotels and homestays available. 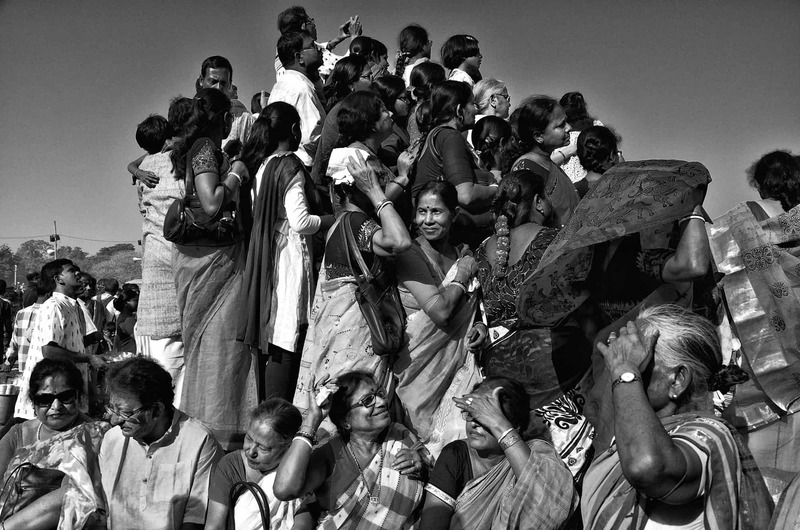 Buy a saree or two from the mela. I love the ones they sell in Batik print. Indulge in Dhokra jewellery. The brass metal jewelry is a legacy dating back to Harappa civilization. Alternatively, check this page: Iral. Kolkata to Bolpur will take you a 3 hours road trip (about 150 km) . Multiple train frequents the route from Howrah station. I visited from Bankura, which was a 96 Km journey. You may also want to visit Shantiniketan during Paush mela (the last week of December). The chill of winter will remain. 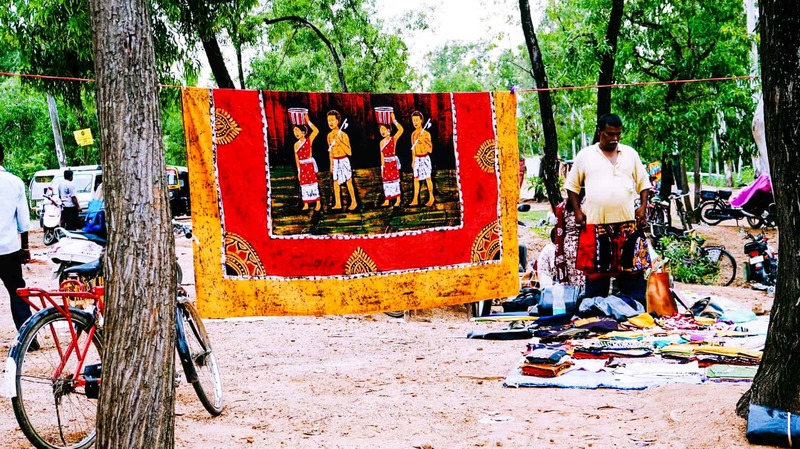 The mela where villagers come and sell excellent handcrafted lifestyle products. On display, a bed sheet with Batik prints. 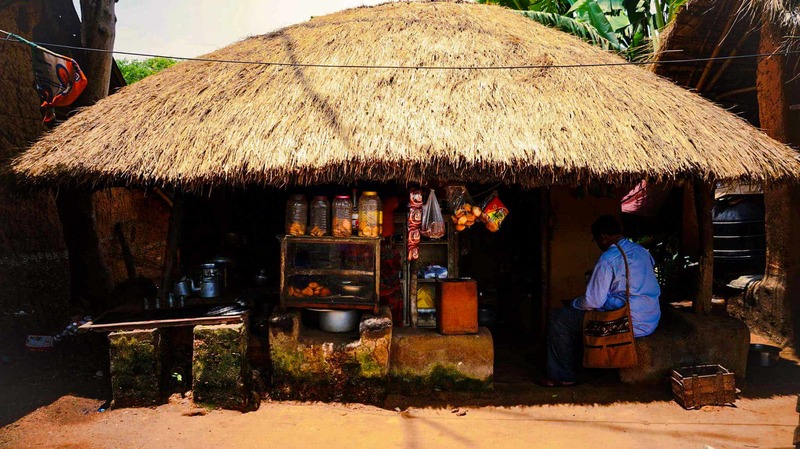 A hut that sells quick refreshments. Note the plastic jar that stores local made sweets. Try Gaja if you would like. *Asharam or Gurugriho is the place of education as described in Hindu Mythology. PS: Shantiniketan has been in the tentative list of UNESCO sights since 2010! 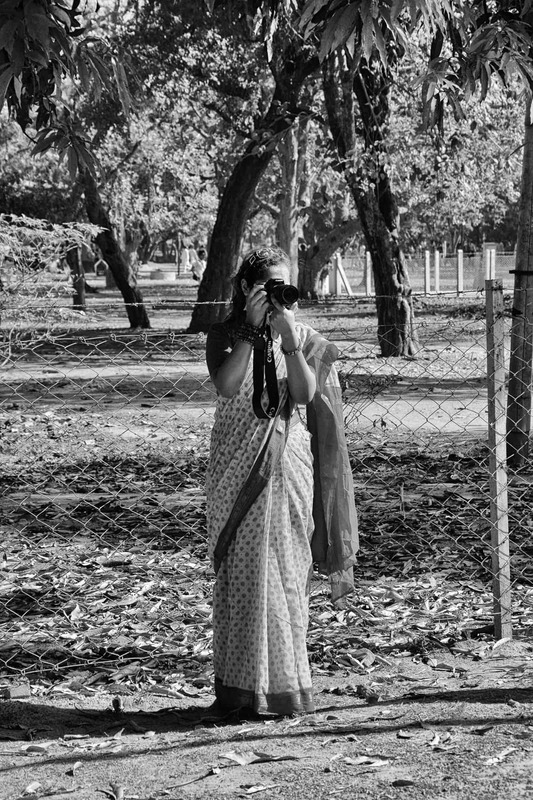 My visits to Shantiniketan date back to a decade and more. My father had a penchant for photography. However, as far as I remember, we did not click any photo but came back home with a lot of copy of sketches made by Rabindranath Thakur. In order to produce this blog post, I had to request for photos to the amazing photographers I know. Their kind contribution made this post look as beautiful! When I requested for photos for Nilanjan Karmakar, he readily agreed to provide the snapshots, even if I wanted the colored variation. However, on a second thought, I decided to use the black and white series. The vivid life is expressed beautifully through the captures. So much life and positive energy! You have already met her in the captures of Dakini Jogini! These are captured by Amrita Gagan Chakraborty. “Khelbo holi, rang debo na, taai kokhono hay?” We will play holi and not smear each other with color? 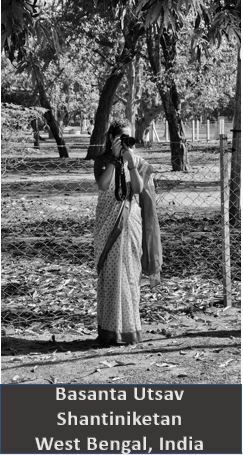 I thought of using her vivid pictures to depict how life really looks like in the rural Bengal. Connect with her in Facebook and Instagram. And of course, read her blog! 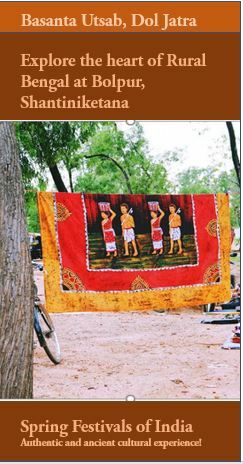 In case you are planning a trip to Shantiniketan, you may consider purchasing the following. Book your stay with Booking dot com for the best price! Thank you for sharing your experiences of celebrating Holi! I loved the photos you shared. For the consider purchasing the following are there supposed to be pics or links? I don’t think I’m seeing them aside from the Booking.com. Umm. No No, you need to visit there and purchase these stuff. 😀 The handicrafts are made by locals, mainly tribals and sold in the local fare. Thanks for sharing a unique look into the culture! I love the photos! I bet this was an amazing experience! I’ve never been to India but I really want to go! You have such a beautiful way of writing that almost reads like poetry. I love how eloquently you describe the sights and sounds of this celebration. The photography is beautiful as well. There is something so timeless about a black and white photo. I’ll always be partial to color, but there are times B&W just does a better job conveying a certain feeling and it worked so well in your post! Amazing & a gem of a post! It describes perfectly the cultural side of India. Do you think it’s safe for a solo traveler to visit this area? Hey Stef. Thanks fort stopping by. It is absolutely safe for a solo woman traveler visiting this area. What wonderful photos. I have heard so many great things about Holi, would love to experience it. Do come down to experience the extravaganza! I have been in India twice. Always wanted to have experience of Holi, but never was in correct time! It’s very colorful and perfect for photo shooting!! It is so great to hear you have been in the country for couple of times. I hope holi or not, you had a great time! Wow – Nilanjan’s images are amazing! Thank you for including the useful points to remember. Is not it? I loved them to the core. I wish you a happy holi! Holi is one of the most exceptional holidays in the world which I soon hope to cross off my bucket list. Your pictures are so stunning and inspiring! Thank you for your kind words. Do visit India for the Spring Festival. You shall not regret. My word! Shantiniketan is the place where peace and nature gets married to each other! You must definitely plan a visit.